While the name may not hold the prestige of brands such as Fender or Gibson, Yamaha deserve big respect for their popular Pacifica series, with a range of quality guitars that defy their price tags. 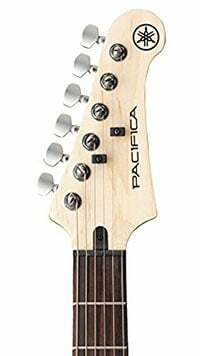 Their stylish Pacifica 311H is an affordable version of the upgraded mid-range custom shop 611HFM, and reaffirms that the Japanese giants are not afraid to try something different in the mid-range market. The Pacifica 311H is cut from the same cloth as the more expensive 611HFM, and on looks alone it would be tricky to tell the two apart. The 311H sports the familiar Pacifica body, which is a well-defined, curvaceous Strat-style double-cutaway shape with a 25.5” scale length. It’s crafted from solid alder, and looks gorgeous in its natural yellow-stained finish, although the Black, Metallic Red, and Vintage White varieties all equally impress. 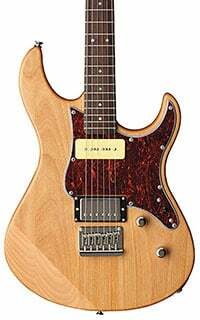 Bolted onto the body is a fast-playing maple neck, which is left unfinished – and actually benefits from this, as the feel is awesome – with a rosewood fretboard and 22 medium frets. The 311H feels well-built and comfortable to play – in fact, just as good as the 611, especially after a good set-up. The hardware on this guitar is simple but solid, with a few quality components that impress. The 311H comes loaded with Grover locking tuners in a six-in-line configuration, as well as a Graph Tech Black Tusq nut, which are both welcome additions and a sign that this is more advanced than something you’d find in the entry-level domain. Straying away from the usual tremolo system you see on a Pacifica, the 311H sports a Yamaha-designed fixed bridge with steel saddles (instead of the 611’s graphite saddles), which complements the locking tuners for a system that will hold your tuning well and offer good sustain. It’s ‘under the hood’ where the two guitars differ the most, although the 311H still comes loaded with two very good quality Yamaha-designed pickups. There’s an Alnico V P-90 at the neck – an often overlooked pickup style, but one that remains popular among vintage seekers – and an Alnico V open-coil humbucker at the bridge. On its own this is a versatile combo, but this versatility is increased further thanks to the coil-splitting capabilities on the humbucker, controlled via a push/pull mechanism on the master tone control. The guitar also comes with a master volume control, and a three-way pickup selector switch. With two pickups that have completely different qualities, the 311H is unsurprisingly a versatile guitar with a sound that impresses. You can find a wide range of smooth tones suiting many styles, although the classic rockers and blues enthusiasts would find the greatest satisfaction. The P-90 in particular gives a warm vintage blues tone, with good clarity – a classic P-90 sound, if a little reeled in. The bridge humbucker is great for more meaty, full-blooded rock tones, especially when played with a good distortion pedal, and you can easily find that classic single-coil sparkle when using the coil-splitting. Not the loudest of outputs, but for a good price it’s hard to fault what’s on offer. When compared to the more expensive 611HFM, you can see why the 311 is cheaper in price. However as a standalone model, the 311H’s premium style and playability, combined with good quality components and a versatile vintage sound, make it another Pacifica guitar that punches well above its weight. 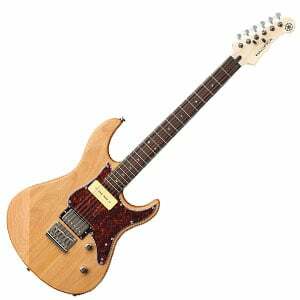 For more info about the Yamaha Pacifica 311H, click here.